The first in a series of print book Nonfiction Minute collections. Changed the World, brought to you by today's award-winning and best-known children's authors. In this collection of 30 essays, each historical figure has a short piece -- called a Nonfiction Minute -- dedicated just to them, with helpful and intriguing visuals. Learn how African-American singer Marian Anderson sang her way to the White House, and how an indentured servant named Juan de Pareja became an artist. Read all about Albert Einstein's theory of relativity -- yes, it can be explained in a minute! 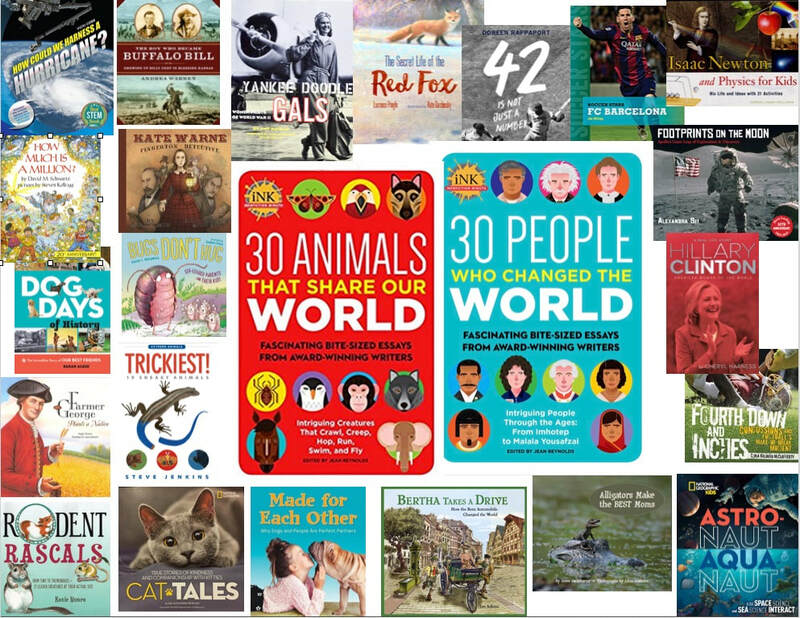 These nonfiction "appetizers" are quick and easy-to-read, and will have children begging to know more about the world around them. Do you know who the world's smartest animal is? How exactly do spiders spin their webs? Have you heard about the tiniest frog on earth? 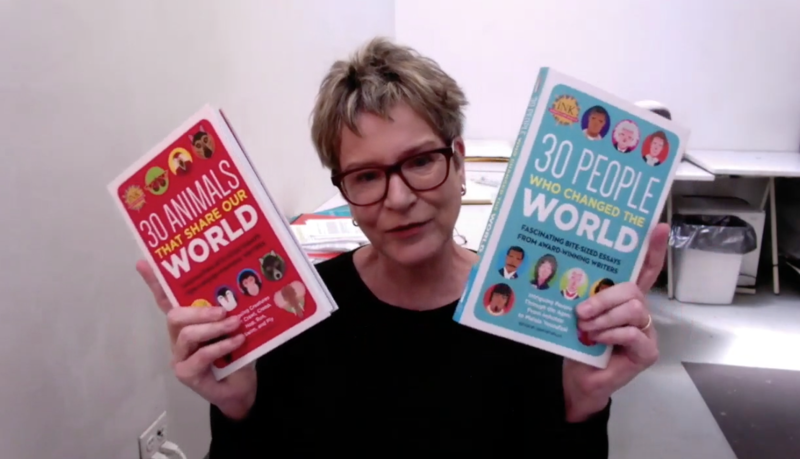 Find out the answers to these questions and learn so much more about our world's fascinating creatures in 30 Animals That Share Our World! Written by today's best known, award-winning children's authors, each bite-sized essay in this great collection gives children an excited peak into the amazing animal kingdom. Vicki Cobb, NFM Founder along with Alexandra Siy, invited Roxie Munro to participate remotely in a BLC18 (Building learning Communities) program in Boston - here's the video introducing iNK Think Tank's project, the print collection of the Nonfiction Minutes. Jan Adkins, Sarah Albee, Vicki Cobb, Sneed B. Collard III, Cheryl Harness, Kerrie Logan Hollihan, Steve Jenkins, Tris Marx, Carla Killough McCafferty, Heather Montgomery, Marissa Moss, Roxie Munro, Amy Nathan, Aline Alexander Newman, Dorothy Hinshaw Patent, Laurence Pringle, Doreen Rappaport, David M. Schwartz, Stephen Swinburne, Alexandra Siy, Jennifer Swanson, Peggy Thomas, Andrea Warren, and Jim Whiting. by iNK members in 2017-18!